As there was some kind of event called “Christmas” going on there was no track on Monday. Instead I took to the streets for a LSR with Rob. 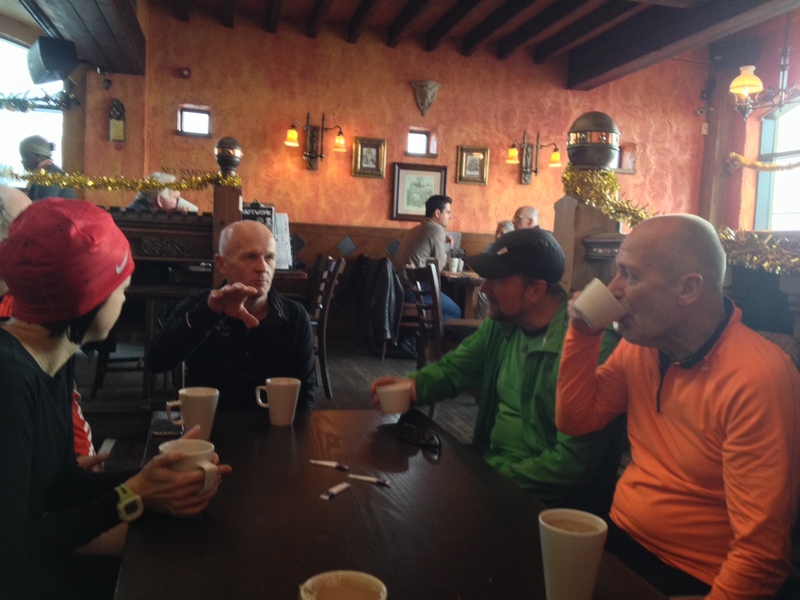 As it was very very windy I thought a nice run inland would be sensible but Rob thought it would be an excellent idea to run down to the seafront and along to Carat’s café. This turned out to be a marvellous idea as I could hardly move whereas he was skipping along merrily. Good for … something I’m sure. Anyway it meant when we turned round we were positively zooming back Brightonwards. We then cut back inland so that I didn’t need to run back once again into the horrible wind. Well I would of course but along Old Shoreham Road which I hoped would be slightly less hellish than the seafront. In the end I went up to Dyke Road Avenue and then down Woodland Drive so only a short stretch on Old Shoreham Road that was thankfully slightly less windy. It was a good start to the week regardless of windiness as I notched up a good solid 14 miles. On Wednesday I went out for another, this time in the esteemed company of Danny and Stephen. It was still a bit windy but nowhere near as awful as Monday and we stuck to a more inland route. Apart from the seafront bit but that was going with the wind and I requested an inland return so that I would not once again have to battle the wind home along the seafront. We were averaging 8.20mm and I felt the need to attempt to throw in a faster last two miles. 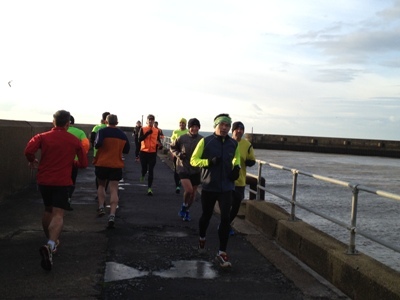 I felt like I picked up the pace when I rejoined Old Shoreham Road for the homeward leg so a successful 11 over all. 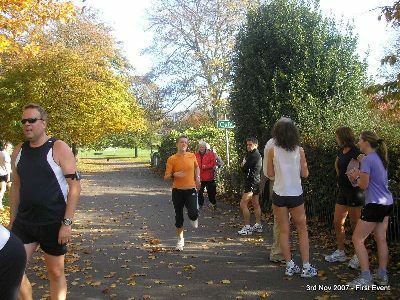 As most people were taking it easy I found myself in the lead for the first 500m or so (except for a man being dragged along by a speeding dog). I did not like this but luckily I was overtaken by a few people at the top of the wiggly path. 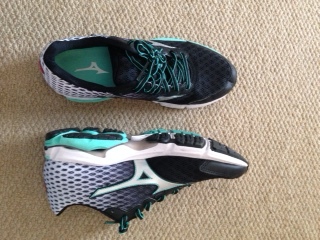 I had decided I actually had to try in a run having not really done so for a year(ish). I still knew Andy would overtake me at some stage even though he is injured so was having to take it easy on the up/downhills. I made it to about 4k before he went passed me. Dagnammit! However I was still about 5th and the main fact was I tried all the way (I think) and crossed the line in 20.22 which is somewhat better than I’ve done recently. I was rather pleased with this time and my effort throughout. On Boxing Day it was off to Preston Park for the traditional Boxing Day Races. I always plump for the full 4 laps of the park which is approximately 5.5 miles in total. I wanted to give this race my full effort too. 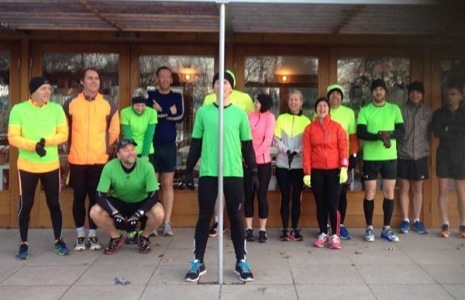 It was absolutely blinking freezing and I set off with completely frozen fingers and toes as seems to have been the case on every run recently. On the first lap I stormed (as much as I ever do) up the long hill on the 3rd side. I tried to use the downhill too. 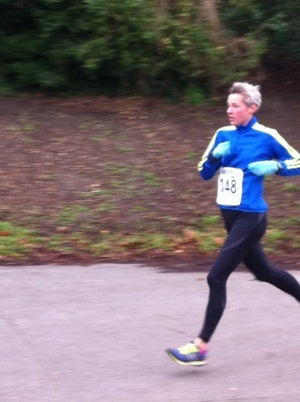 Although I inevitably slowed down after the first lap I kept up the effort. Cathy sped past me and I was unable to keep with her but I still managed to finish in third place somehow. I quite enjoyed this run as I was pleased I’d managed to put in full effort for a second day running (pun intended). 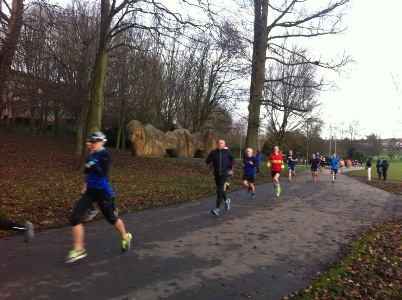 I was surprised to discover it was then Saturday so it was back to Preston Park for a normal parkrun. It was so unbelievably cold and windy I was slightly worried my face might fall off on the bottom straight. Alas it did not. It did however cause me to slow down massively. Joe had slowed down to run with me and really helped me to keep going. It turned out that I was able to try even harder this time then ever before. I then realised I am one of those really annoying breathers that one tries to escape from. High pitched wheezing fool. I was totally surprised and majorly disappointed when I crossed the line in 21.04 as I put in so much more effort than I can ever remember having done. Oh dear. No matter though as I proved to myself that I CAN put in effort and hopefully one day when the weather is less Arctic and I haven’t raced the two days previously perhaps I could actually be faster again. 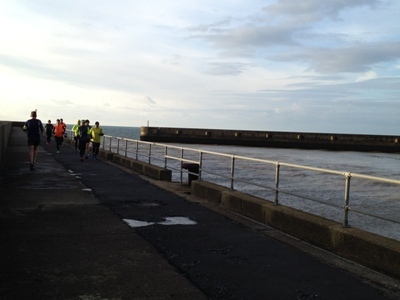 This morning (Sunday) it was off to The Level with the posse for a 10 mile loop over to Rottingdean. We set off up Elm Grove and I discovered to my great surprise that I found it reasonably comfortable. What the? I don’t think I’ve ever found a hill easy ever. Ever. Possibly helped by me having been thinking of Bear Road which is much steeper and more evil, but then perhaps I would have been able to speed up there too. After this ascent it was an undulating but very pleasant run in the bright sunshine, freezing temperatures and not too windy wind to complete a good running week. 49 miles of mainly frostbitten windiness. Monday turned out to be a beautiful day. Sunny and cold with only a slightly too windy wind. I had a feeling it would be too icy come track time so decided to make the most of the excellent weather and get a long run in. As I am now a watchless I have no idea of my pace but I did my usual 13ish mile route in around 1.55 I must have been averaging 8.30mm ish. Ahhhh the calmness of imprecision. I am glad I did this run as the weather was forecast to be unpleasant later in the week so at least I had one long one in the bag. 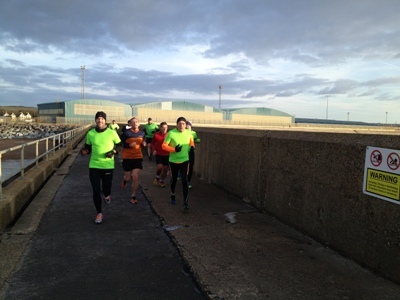 On Wednesday I managed to fit in an unexpected 4 or so slow seafront miles whilst we were being trained up to hold a run club at work. It was rather cold but another crisp and sunny (and windy obviously) day. On Thursday I had the pleasure of running with the perfect pairing of Rob and Danny. They make excellent flankers when it’s windy which it certainly was. This was a really nice run in the bright sunshine once more. Alas though the last stretch was horrible. 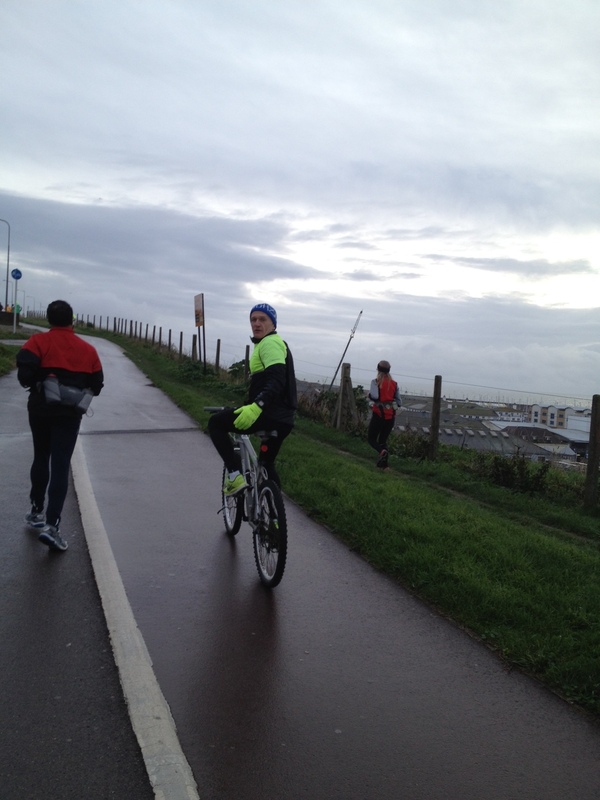 Once I’d left Danny and Rob I had to run 4 miles home into a massive headwind. I didn’t even notice the wind the first time when all three of ran that way together. A fine example of how running with others (especially these others) makes it all so much easier and more enjoyable. 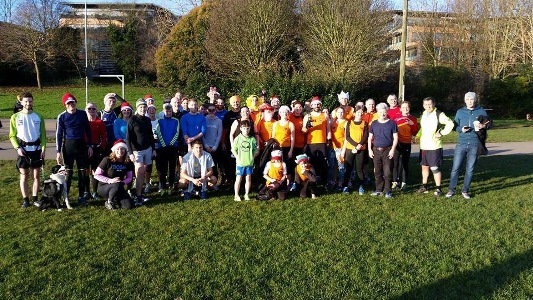 Saturday heralded a return to Hove Park for parkrun as a tester before next week’s Arena Age Graded superseries race there. It was absolutely blinking freezing. I had forgotten quite how crowded and horrible the beginning of this parkrun is. This is no excuse for reaching 1k in 4.12 either. I didn’t get any faster as the miles continued. However I was trying all the way and I did storm up the hills overtaking people (a very rare occurrence). Eyes shut for 80% too so I really was putting in the effort. My time was 21.13 though so all that effort for no reward but as I was trying my hardest I can’t really complain though of course I shall. It was Rick’s 200th run. We were both there at the first ever Hove Park Time Trial (as it was called then). Fatter, unfitter and much slower. We didn’t know each other then and now look at us. Svelte, fit and speedy (well Rick is at least). He was only 3 seconds adrift of his PB which was an excellent effort in the arctic conditions (he was wearing shorts too). Although I didn’t particularly enjoy the run due to being far too cold I enjoyed the change of scenery though will be glad to get back to Preston Park for it’s relative emptiness after next week’s superseries. Today (Sunday) it was out for yet another LSR. I set off early with Rick to get 4 ish miles in before we met up with Danny, Trevor, Rob etc etc for a nice steady 9 or so miles. Thankfully it was another sunny and cold day (though no where near as freezing as yesterday) and the wind was at a tolerable level. 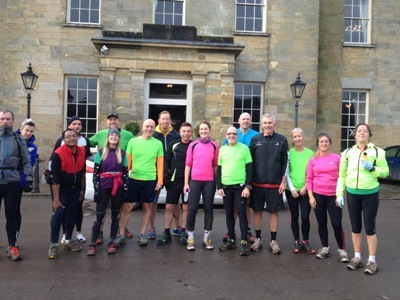 A very enjoyable 13 miles with a bargain (80p!) cup of tea to finish. 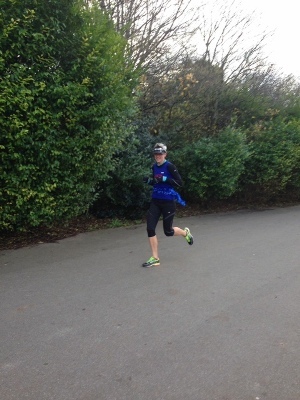 43 miles for the week with nothing speedy other than parkrun which wasn’t. The week started as is so often does, on Monday. Which meant track of course. This week wasn’t so cold that the track was icy which was a good start. Then Bob said the session was 8 x 900. Ug. The reps were to be paced thus: 800t, 100f. 700t, 200f all the way down to 100t, 800f to finish. I just stuck to the back of my group. I felt comfortable throughout. Good stuff. Then everything went wrong. 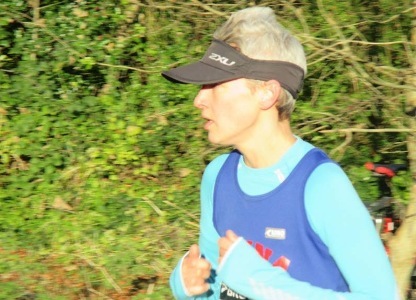 I had planned to go for a long run on Wednesday morning with Danny but his knee was playing up and I discovered when I got up on Tuesday that something untoward had happened to my left hip flexor. Then I had too much work to go to which meant 4 days rest. 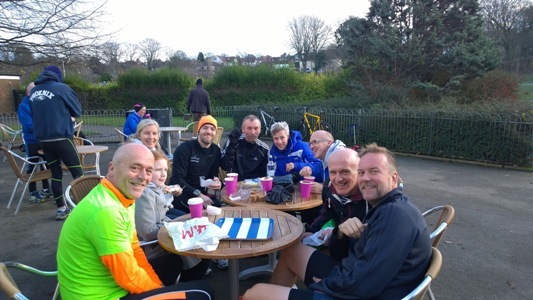 Preston Park lured me over on Saturday morning for a totally freezing parkrun. My feet thawed out sometime after I finished. Surprisingly, although the ground looked very frosty it wasn’t slippery. However as I was dragging blocks of ice in place of feet it was quite tricky to get up a good pace (so it felt). I went watchless today. I think I do better without out. I put too much pressure on myself with. The information a watch provides doesn’t spur me on rather it just makes me get annoyed at how crap I feel I am. Anyway I guessed my time would be 20.51 as I was roughly 20 seconds behind Mal who had timed himself at 20.33. 20.52. What a guess! So although I felt I was somewhat hampered by frozen extremities my time was consistent with what I’ve been running recently. 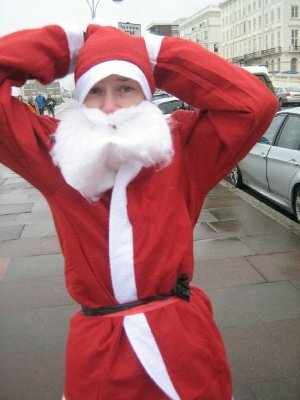 In the afternoon it was off to Lancing for the next league cross country. This is my favourite of the cross countries but as I hate them all that doesn’t mean I like it. After Plumpton though it is a dream. Basically a big uphill followed by a big downhill. Took my Speedcross out for a test drive though this course is almost as dry as Goodwood. In fact they are still clean enough to wear to work. Possibly a two feet on moment at the top of the first bit of hill – thanks Mike! 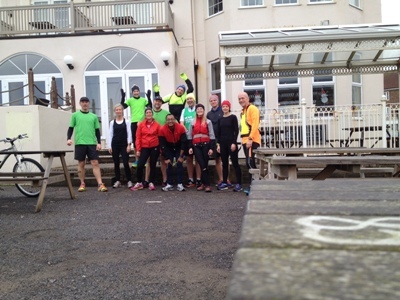 On Sunday I went out for a run with some of the Arena crew. 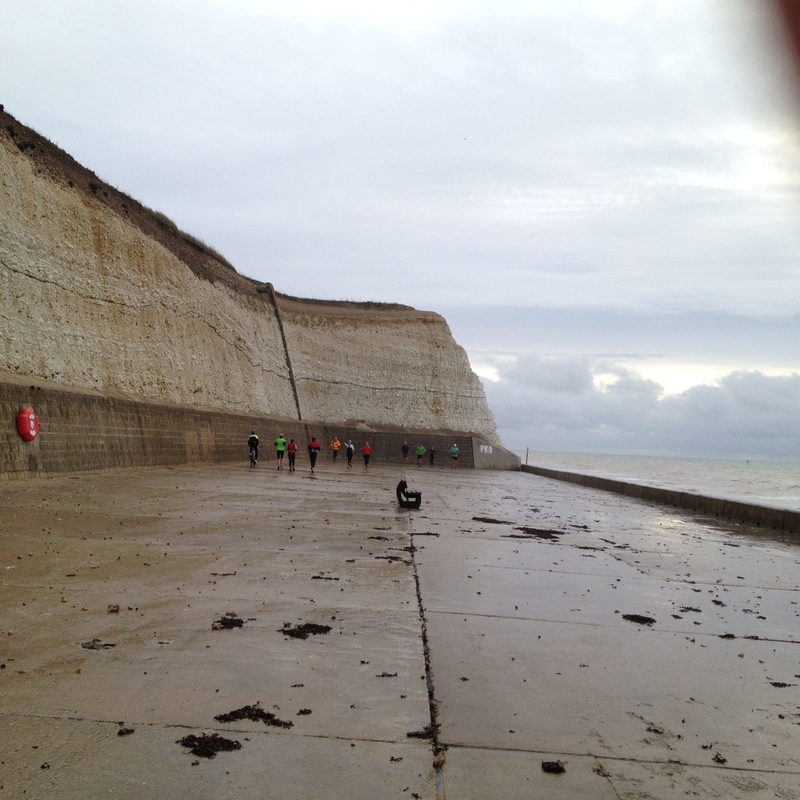 It was a nice gentle pace from the marina out towards Saltdean and back. There were a few dicey moments when the sea tried to get us by hurling itself over the sea wall but luckily Rob was there to make sure I soaked it all up so he remained dry. As Trevor was injured he had to ride my bike but this is good as otherwise it shall never see any action as it is a mountain bike and I always just ride my old man bike around town. A very short mileage week this week. 21 miles. Back on the LSR wagon next week.